Tuesday turned out to be Chris Van Allsburg day for me. And now I wish every day could be Tuesday. Van Allsburg is the Caldecott-winning author and illustrator of JUMANJI and THE POLAR EXPRESS, in addition to less well-known but still stunning picture books. He came to the Pacific Northwest this week on behalf of an artist named Harris Burdick, who's just re-released his classic illustration collection. This time, though, they've been printed on paper that allows them to look more as the artist intended. And each has inspired a story written by some of the most interesting writers working today: Sherman Alexie, M.T. 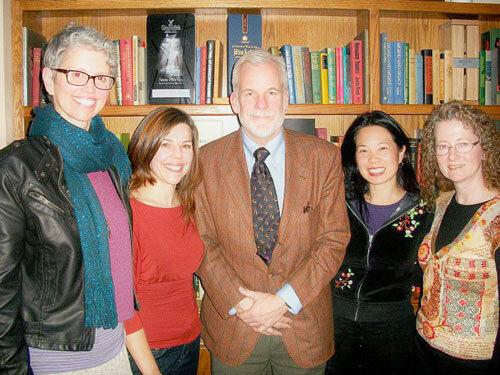 Anderson, Kate DiCamillo, Linda Sue Park, Louis Sachar, Lois Lowry, Jon Scieszka, Lemony Snicket, and Chris himself. On the one hand, the project seems like a raw deal for Chris. Harris Burdick definitely knocked off Van Allsburg's singular illustration style. 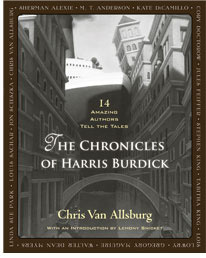 But on the other hand, Chris did let it slip that he gets all the money for THE CHRONICLES OF H ARRIS BURDICK, a truly stunning volume. Along with some of my dear friends from readergirlz, I chatted with Chris about his work, mezuzahs, raccoons, and the virtues of drawing from live models instead of photographs (and not necessarily in that order). That last topic was particularly thought-provoking for me. Apparently cameras and eyes don't work exactly the same. That I knew, more or less (and not only because my camera makes a clicking sound when it's taken a picture, and stops working when I drop it). In addition to distorting the imeages, though, photographs provide too much information. It's hard to know what to leave out, which tends to lead to the creation of photorealistic renderings instead of art. Chris's drawings are so incredibly detailed, so richly imagined that I might have, in my more innocent era (which ended Monday), called them photorealistic. But now I'm realizing that isn't the case and why it's so important. When you look at Chris Van Allburg's art, you really feel something, which is why so many people were inspired to write stories when his original Harris Burdick illustrations were published. It's not just what he puts on the page that makes his art work, though. It's what he leaves out. This is a totally intriguing idea and now I am thinking about how I can apply it to the extremely complex novel I'm working on. It's one reason I so enjoy the opportunity to meet other people in this line of work. It gives me a new way to think about what I'm trying to create. The emotional response is everything, and we have to leave room for that, even as we try to build a complete world. Later that evening, I watched a screening of a documentary called "Library of the Early Mind." Directed by Edward J. Delaney, the movie explores the impact of children's literature on kids, on adults, and on our culture. 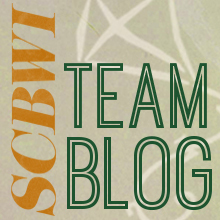 It's part fascinating, part inspirational, part hilarious and entirely fun to watch. And who was the illustrator featured in the opening image of the movie? Either Chris Van Allsburg or Harris Burdick. I really couldn't tell. A trailer is below. Do see the whole thing if you can! Trailer: 'Library of the Early Mind' from Backspace Productions on Vimeo.